Congratulations to Dr Junichi Matsuo, Research Scientist from Prof Yoshiaki Ito’s group! Dr Matsuo’s abstract titled ‘RUNX1 Enhancer Element eR1 Marks Tissue Stem Cells in Mouse’, was selected from out of 1,400 abstracts as a winner of a travel award for the Annual Meeting of the International Society for Stem Cell Research (ISSCR). 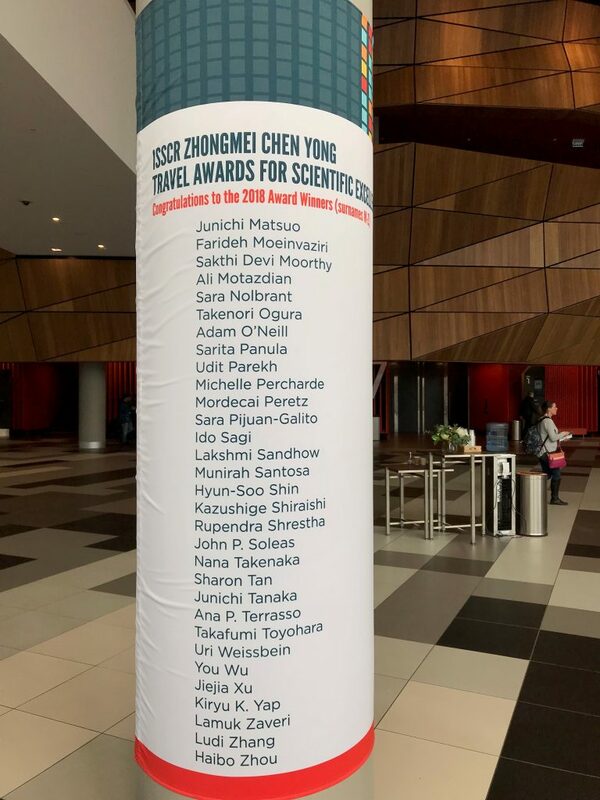 The travel award allowed Dr Matsuo to attend the conference, which was held from 20-23 June in Melbourne, Australia, and present his excellent research work. The ISSCR Annual Meeting attracts more than 3,500 attendees in the stem cell community all over the world to discover, share, and network. It is the world’s largest stem cell-focused meeting, consisting of more than 150 speakers and 1,400 posters. Runx1 is required for generation of hematopoietic stem cells from endothelial cells. Between the two promoters of Runx1, there are multiple enhancer elements. One of them which, we call eR1 (270 bp), drives the expression of Runx1 in hematopoietic stem cells. Transgenic mouse (TG) was produced containing eR1 linked to heterologous promoter and GFP. eR1 in TG mouse faithfully induced GFP in hematopoietic stem cells. Interestingly, in this TG mouse, eR1 drives the expression of GFP in tissue stem cells in multiple organs including stomach, intestine, colon, liver, pancreas, lung and mammary gland. Lineage tracing experiments revealed that eR1+ cells are indeed tissue stem cells. In the case of mammary gland, luminal epithelial stem cell was marked by eR1. Consistent with the results of in vivo lineage tracing experiment, organoids were generated from eR1+ cells from these multiple organs. Most cancer cells may be developed from tissue stem cells, and eR1 can be a useful tool to examine the step-wise carcinogenesis by activating and inactivating the genes of interest in eR1+ cells. We crossed the mice carrying eR1-CreERT2 with Runx1F/F or Runx3F/F mice to examine the effect of depletion of Runx genes in mammary gland. When CreERT2 was activated by tamoxifen, eR1+ luminal epithelial cells showed robust expression of ERα and ki67 and the cells multiplied towards the lumen of the gland. These results suggested that elimination of Runx expression in luminal stem cells induces first step of breast cancer carcinogenesis. RUNX1 is known to be significantly mutated in luminal type of human breast cancer.